An Ormond Beach couple has offered to donate $3 million to build the planned 24-court complex at the city’s Hollyland Park. It would be the second-largest pickleball facility in Florida, trailing only a 50-court facility in Naples. The target opening date for the Pickleball Daytona of Holly Hill complex is early 2020. Rainer and Julie Martens are asking the city to contribute $1 million in Community Redevelopment Area funds to cover the project’s infrastructure costs. On a hot sunny afternoon in November a group of volunteer members and our own IPTPA certified instructors gathered together at Pocahontas Park in Vero Beach for the purpose of introducing pickleball to eight local physical education teachers. 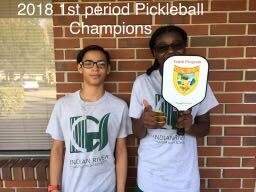 Pickleball University decided earlier this year that we wanted to take the sport of pickleball into our local schools in Indian River County, so you may ask how did we make this happen? Our club's Board of Directors lead by club president, Mari Colacino, identified a small core group of our players to form a "Schools/Juniors" committee. Together they developed a plan to raise money, purchase equipment, identify and train volunteer club members who assist our professional instructors. Over time our club members started reaching out to friends and friends or friends involved in our local schools at all levels to seek out teachers and identify school physical education programs that expressed some interest in pickleball. Sounds easy enough right? About as easy as hitting a successful around-the-post pickleball shot! 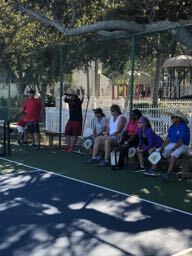 The group of PE teachers that came out to our courts on that hot November afternoon had a great time learning what pickleball is all about. To a person they expressed a sincere desire to teach our great sport to their students. Our committee hopes to continue its good work into the new year by expanding our youth programs i the district and beyond. The $1100 we raised were used to purchase w24 paddles, four portable nets, dozens of balls and a portable storage box to be circulated and used by our schools in Indian River County. Our club's mission now is to grow and strengthen our partnership with the school district and together pass our love of this great sport onto the students. Our vision is to have every child be able to learn how to play pickleball. It is a sport that can be played for a lifetime!